Business is booming in Midtown and northwest Detroit, where several stores and restaurants are opening and expanding this week and next. In Midtown, the 38-unit Brentwood on Prentis Street, between Second and Third avenues (behind the Motor City Brewery), is officially on the market. The recently renovated apartment building is now leasing one-bedroom apartments for $800 to $900 a month. To the north, the Pod Drop has opened its first Detroit location in the New Center One building on West Grand Boulevard. The business, which also has locations in Madison Heights and Rochester, specializes in the repair of iPods, iPads, and iPhones. Next door at the Fisher Building, the Zenith restaurant on the first floor of the historic structure plans to launch its full service bar on Monday — complete with cocktails inspired by Alfred Hitchcock films. The Zenith Tiki Lounge will offer an extensive drink menu to complement its fusion of southern and Mexican cuisine. On the northwest side of the city, Banner Supermarket, an independent grocery store near the intersection of Schaefer Highway and Lyndon Street, has kicked off a $5.8-million expansion that will double its footprint in Detroit to 40,000 square feet. 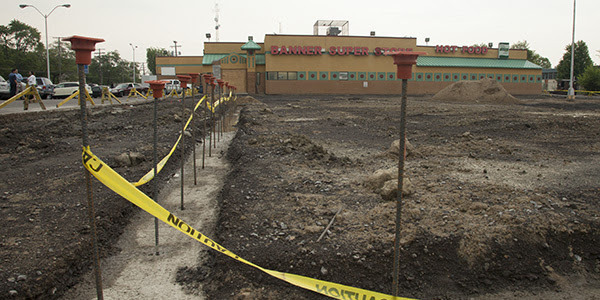 The store will remain open during construction, which is expected to be completed early next year. The expansion project will double the size of every department as well as add a pharmacy, a bakery, a hot food deli, and a seafood counter. The renovation includes a new entrance, parking lot, and landscaping improvements. “When we are done, it will look like a brand new store — inside and out,” says Shina, noting that the store will add more than 25 jobs as part of the expansion. Banner’s expansion has received support from the Green Grocer Project, which provided a technical assistance grant and facilitated financing through Invest Detroit, Chase Bank, and a New Market Tax Credit set up by Capital Impact Partners. “We recognize the way Detroit’s independent grocery stores can help lead the way toward neighborhood revitalization, providing jobs, and keeping consumer dollars in the city, so we support that any way we can,” says Mimi Pledl, program manager for the Green Grocer Project, which is managed by Detroit Economic Growth Corp.